Do You Have One of These Top Ten Missouri Car Accident Injuries? Then You Deserve Compensation! You don't wake up one morning expecting to get into a car accident. You don't leave your house prepared for the intense pain that awaits you just a few miles down the road. 1. Head Injury – Perhaps you banged your head against the side of the vehicle or the headrest. If you weren't wearing a seat belt you may have been thrown into the windshield or out of the vehicle. You may even have suffered a head injury with no direct impact simply because your head snapped back so quickly that it caused internal damage. 2. Whiplash – This is one of the most common types of injuries following a Missouri car accident. We typically associate it with neck pain, but whiplash often affects the nervous system thereby translating pain to any part of your body. 3. Back Injury – The sudden jolt that forces your body to jerk awkwardly in an accident often affects the back. Even low-speed crashes can cause significant lower back pain, thanks to a damaged disk. 4. Spinal Cord Injury – A serious crash can throw your spinal cord into misalignment, dislocating or even crushing the vertebrae. Depending on where the injury occurs, you may be partially paralyzed. 5. Soft Tissue Injury – This refers to tears in your body's delicate tissues, muscles, and nerves. Don't let the term “soft” fool you. These injuries are extremely painful and take time to heal. They are often more difficult to prove in a personal injury case because the damage may not be immediately evident. 6. Injury to Internal Organs – Perhaps the air bag crushed your chest. Maybe the seat belt saved your life but left your abdomen in pain. Internal injuries can be extensive and may include internal bleeding as well as damage to such all-important organs as your heart, lungs, or any number of abdominal organs. 7. Broken Bones – A serious fracture or crushed bone can cause a tremendous amount of pain. You may require surgery followed by months of physical therapy before you are back to normal. 8. Knee injuries – The knees' close proximity to the dashboard makes them an easy target in any car accident. Significant damage to your knees can affect you for life. 9. Injury to Limbs – Whether it's a broken bone, a tear in a crucial ligament, or even an injury requiring amputation, our arms, hands, legs, and feet can suffer serious damage in a car crash. 10. Emotional Trauma – We rarely list this as an accident “injury,” yet every person hurt in a serious St. Louis car accident must deal with the emotional distress of going through such a traumatic ordeal. In many cases, you may be able to win additional compensation for this pain and suffering. When you've suffered big injuries in a car crash in Missouri or Illinois, you deserve a big settlement to help pay for your medical bills and get your life back to a new normal. 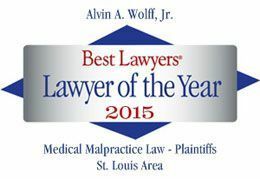 Call St. Louis car accident attorney Alvin Wolff, Jr., at 877-241-1020 to set up an appointment.